In an effort to enhance American security and address climate change, the U.S. military is diminishing its footprint. The military is producing cleaner power, reducing energy consumption, managing water and minimizing waste. Their efforts encompass vast numbers of vehicles, ships, planes, buildings, lands, and other facilities. A major impetus for these efforts is Executive Order 13514, “Federal Leadership in Environmental, Energy, and Economic Performance,” which President Obama signed on October 5, 2009. It mandates a 30 percent reduction in energy usage by federal agencies. Climate change has been an important issue for the Department of Defense (DoD) dating back to the dawn of the 21st century. In 2008, the DoD set the goal of generating 25 percent of all energy from renewable sources by 2025. In 2009, the U.S. military launched several clean energy initiatives including solar and wind projects. The DoD’s current Comprehensive Energy Strategy involves annual reduction requirements, which include energy, water, and GHGs. 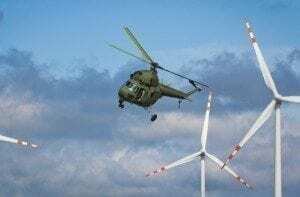 A Pike Research report titled, “Renewable Energy for Military Applications”, indicates that annual spending on renewable energy by the Department of Defense (DOD) will reach $10 billion by 2030. The US Department of Defense (DoD) spends approximately $4 billion per year on energy. About one quarter of these costs come from 500 fixed installations, comprising nearly 300,000 buildings that cover 2.3 billion square feet. To help manage these facilities, the DoD has developed an energy strategy designed to reduce energy demand through conservation and efficiency. To achieve these goals, they are expanding their supply of renewable energy and leveraging advanced technology. The DoD realizes that a fossil fuel dependent war machine is vulnerable, they also understand the importance of adopting broader sustainability goals in which environmental security is a key element of national security. The DoD has also worked on a broad range of smaller projects including removing hazardous or toxic materials like traditional paint and replacing them with safer alternatives. The process of greening the Army has been going on for years. According to a 2007 Sustainability Report, 78 percent of Army building projects were being designed to meet LEED standards. Between FY 2004 to FY 2007, the Army reported a reduction in energy use intensity in its facilities of 8.4 percent, a reduction in solid waste and construction debris of 5 percent, and a water reduction of 32 percent. The Army now has a Net Zero initiative that is a showcase and a learning opportunity for the world. This ambitious sustainability program was launched in 2011 under President Obama. The Army defines net zero energy as the ability to produce all energy requirement on site. For water, this implies returning the same volume of water to watershed as the amount that is used. Net zero waste also means that no waste goes to landfills. In recognition of the army’s efforts, in 2011, the base in Grafenwoehr Germany won an environmental leadership award. The Army is also producing large-scale renewable energy projects. As part of a wider $16.8 million contract to implement energy-conserving upgrades, the Army is building a 4.465 MW solar photovoltaic system at the White Sands Missile Range, in New Mexico. In 2011, the Army created the Energy Initiatives Office Task Force, to source 25 percent of its energy from renewables by 2025. Renewable energy production in the Army is estimated to require an investment $7.1 billion to generate 2.1 million megawatt hours over the next 10 years. The Army has ambitious plans to cut its greenhouse gas emissions by 30 percent in 2015. In the fall of 2008, the Navy announced its goal of reducing greenhouse gas emissions by 50 percent in the near term. The Navy is also transitioning away from fossil fuels and increasing its use of biofuels. It is developing what is called a “Great Green Fleet“—an aircraft carrier strike group that runs entirely on biofuels and other alternative fuels. As reported by Environmental Leader, Rear Adm. Philip Cullom, director of the Navy’s fleet readiness division, told National Defense that in order to generate half of the service’s shore-based energy requirements over the next decade, the navy is transitioning to renewable sources of energy including solar, wind, geothermal and ocean thermal. The Navy is leading efforts to harness ocean thermal energy to generate electricity. Thermal energy could potentially produce three to five terawatts of power, which is about 30 percent of today’s total global energy consumption. In 2010, the Navy awarded an $8.1 million contract to Lockheed Martin to continue development of a 10-megawatt ocean thermal energy conversion (OTEC) pilot plant for the Naval Station Pearl Harbor in Hawaii, which could be in place as early as 2013. Other similar projects could come online as soon as 2020. The Navy is also investing in solar power. In 2010, a $15 million solar installation project at the Pearl Harbor Naval Station was funded through the federal stimulus bill (ARRA). This project saves an estimated 5,667 barrels yearly and reduces its carbon dioxide emissions by 3,118 tons annually. Other small-scale Navy efforts include non-toxic anti-barnacle coatings for new shipboard desalination technologies. The Air Force is serious about reducing its energy demand, and assuring supply through locally sourced energy. According to the U.S. Environmental Protection Agency’s list of top purchasers of green power, the Air Force ranks number one in the DoD, number two in the entire federal government and 18th on the national list. The Air Force plans to produce renewable energy equal to 27 percent of its total electrical consumption. One example of renewable energy production comes from Cape Cod Air Force Station. Late in the summer of 2012, the Station received two new wind turbines which will cut energy costs in half and save an estimated $1 million in annual energy expense. In October 2012, the Air Force announced that it aims to invigorate its energy efficiency initiatives. The deputy assistant secretary of the Air Force, Dr. Kevin T. Geiss, said reducing the force’s energy consumption levels is a must if it wants to continue modernizing and providing new capabilities while also meeting the budgetary restraints facing the DoD. Tinker Air Force Base is committed to an $80.6 million energy efficiency project that will be the Air Force’s largest domestic energy retrofit funded through guaranteed savings. It is expected to save more than twice the costs ($170 million) over 20 years. CO2 emissions are expected to decrease by more than 60 million pounds. The construction phase of the project is expected to be complete in 2015. The U.S. military’s green energy projects number in the hundreds and their efficiency efforts span the globe. The DoD operates a half a million vessels, vehicles, and aircraft, it also consumes more energy than three quarters of the countries in the world. It is the vast scale of the military’s sustainability initiatives that make them truly significant. The patented in U.S., Japan and China MHP includes Any Power Single Cylinder Omnivorous Diesel engine with coaxially built-in supercharger and pump fastened by valve plate to standard hydrostatic motor driving car without hoses and pipes. Engine piston fastened to pump’s plunger. Swash plate synchronizing mechanism provides fully balanced opposite motion of engine and supercharger pistons, continuously variable displacement (CVD) and continuously variable compression ratio (CVCR) with about three time greater fuel economy.